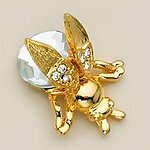 Gold Baby Bee Tacks. Price is per package, 12 to a package. These are our smallest baby bees, all TA91 bees are the same size. TA21 is the next larger size. Save more when buying 12 or more packages. Made in the United States.